While some fibre operators are very good at talking the talk, Hyperoptic appears to have mastered the ability to walk and talk at the same time. The fledgling company which appeared in 2011 announced 10,000 flats and apartments where its FTTB (Fibre to the Building) service was available in October 2012. Now just a few months later the footprint covered by the service has increased to 20,000. Most importantly this is not just a case of rolling out infrastructure in the hope that one day people will signup, with take-up rates that have been as high as 60% in some developments it is clear that there is a demand for the products, which range from 20 Mbps for £12.50 per month through to the full symmetric Gigabit service at just £50 per month. Outside the academic world, which often gets the fastest speeds from our speed tester, Hyperoptic is often showing up with speeds that are around thirty times faster than the average we see for London. The 60% take-up rate is not uniform across their deployment area, but the average take-up is running at over 20%, which reflects both the effect of engaging with residents and landlords as much as the demand for better services. In many parts of London residents in flats can already get FTTC based services, but the additional vertical distances can increase line length significantly for FTTC services. With 4K movie downloads on their way at a hefty 100 GB (GigaBytes), and a much higher utilisation of upload bandwidth from the recently announced Sony PS4 which will be able to upload video from your game play those looking to embrace the best of technology may in just 9 months time be clamouring for speeds like what Hyperoptic is able to deliver now. "up to 370 Mbits/s" ? 370 Mbits/s - what are you referring to Herdwick? If the speedtest, single thread speed may be an RWIN limit of their computer. the typical user experience that someone would measure and complain about :-) "I'm paying for a Gig and only getting less than 400" etc etc. I assumed the above was one of the good ones ? To which the answer is that with a single thread it is possible that there is an RWIN issue with the computer or a flash specific issue that limits socket based speeds on their version. The TBB speedtest crashes a lot with my Hyperoptic wired connection anyway. Fine with wifi. 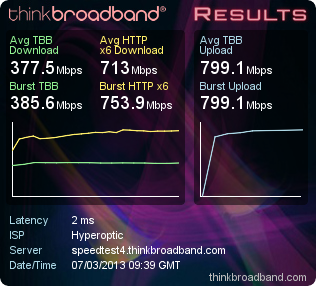 Well done Hyperoptic. I'd always expect initial take up to be lower due to people being in contract with their current provider, but worth getting the faceplate installed at the start to lower costs, then enable once you are near the end of your current term. If the PS4 will be able to upload 4K game footage, that will get interesting. * Can the FTTC solution do that...? * hold that thought.. can the FTTP product do that..? Click on BBC news had reported that DivX have already done a compressed 4k codec with no appreciative picture degredation. So the 100 gig movie downloads don't look like they will happen. @undecidedadrian If they can do 4K at a decent quality in say 30 Mbps - hats off to them. If it copes with high speed action and no artifacts at standard viewing. @ftth Doubt it will upload at 4k, probably a low bit rate 720p style, but fingers crossed Sony will scale quality based on the connection it finds. "* hold that thought.. can the FTTP product do that..?" @GMAN99 - GPON so 2.4Gb DL, 1.2Gb UL (between 32 or 64 customers). Cap is there for reason. Can't wait for the PS4, it will likely have a background download. Full time DL like P2P. Let's see the Throttling games begin. The cap on the Openreach products is there to protect leased line revenues, in a similar manner to a number of other telcos. There are plenty of 100Mb upstream services using GPON. The odds of 64 customers using 20% of their total upstream capacity or even 128 customers using 10% simultaneously are slim to say the least. No real technical reasons, just protecting the EAD revenues. Given it'll be outputting to the TV it's connected to at 1080p that's not going to happen. @FTTH Nothing to worry about with GPON in terms of upload speeds, asymmetric or symmetric 10G-PON in the future when the customer is ready. "Demo" would be a better word than "Trial". They showed that the PON fibre would work at 10G, provided they changed all the electronics in both the customer site and the head-end. But it is still 1G electronics in place in reality. Now if they could just crack the problem of opening this to a wider audience I would jump on it in a heartbeat. Trouble is I live in a house like most of the UK population not a flat. I guess there has to be some advantages to living in a concrete tower.